1/20: Charming cottage with beautiful backyard pool setting. 2/20: Open living area with new furniture and beautiful whitewashed wainscoting. 3/20: New kitchen for Summer 2013 - huge built-in dining room table. 4/20: Kitchen and living room are large, open, and flow well into one another. 8/20: Fun bunk room with built-in full-over-full bunks - great for kids or young adults! 9/20: Fun bunk room with built-in full-over-full bunks - great for kids or young adults! 11/20: Crystal Beach - the gold standard in Destin! Property Size 1,596 sq. ft.
A great home for 2-3 families with children or up to 10 adults max! Or if you have a larger group, we have 3 houses, all right next door to each other! Enjoy a memorable beach vacation in this recently remodeled cottage-style home very close to the beach. The home is like new – with interior updates and modern conveniences – and it still has that special charm and comfort you expect from a classic beach home. With an emphasis on quality and comfort, this home accommodates 6 adults and up to 8 children, offering you beautiful spaces to relax and enjoy every minute of your vacation. This lovely home features 4 bedrooms, including 3 King Masters and a Bunk Room with 2 sets of custom built-in full-over-full beds (yes, that’s 4 full-size beds). It also has 3 full bathrooms. There is plenty of room for everyone to gather in the spacious living area and the incredible custom kitchen is open to the action as well. The private pool is surrounded by brand new decking and beautiful landscaping. 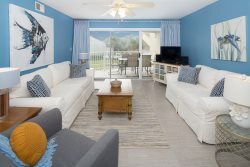 And when you’re ready for the beach – it’s a very short walk – you’re just one house away from the beach road, Scenic 98. The expansive front porch welcomes you into this exceptional home. Inside, you’ll find a bright and beautiful living area with gleaming hardwood floors, custom wainscoting and plenty of seating for your entire group. The wide open spaces continue in the brand new kitchen, where a huge center island is a centerpiece for casual dining with 10 bar stools. The kitchen is a chef’s dream, with all new cabinets, stainless steel appliances including a gas range, massive granite countertops and plenty of space to spread out. You’ll find all the dishes, pans and utensils you may need, a Keurig D-Cup coffee maker, and even a few spices, to get you started. We want you to feel at home, and the large, open layout is a perfect gathering spot for your family or friends. For the convenience of our guests, we have also included a high capacity Samsung HE washer and dryer in the large laundry room. You’ll also find an iron, ironing board, broom, and a few cleaning supplies. We keep our home clean and well updated and pay attention to amenities you expect, such as high-speed internet (free wifi), nice flat-screen TVs, high-definition cable, hair dryers in each bathroom, and more. We also provide items our smaller guests may need like a high chair and pack-n-play. This large bedroom features a KING BED and a nice view of the pool. There are two bedside tables and with lamps and a flat-screen TV. You’ll appreciate the new cotton quilt and super-soft Egyptian cotton sheets. This convenient first-floor bath features a vanity with sink and extra storage, a commode and a tub/shower combination. You’ll also find large, fluffy bath towels and a personal hair dryer. The inviting King Master bedroom is upstairs and features a KING BED with a new cotton quilt and super-soft Egyptian cotton sheets, beautiful hardwood floors, and a flat panel TV. From this room, you can step out to your private second-floor deck to enjoy your morning coffee or relax after a day at the beach. There are two large bedside tables with reading lamps if you’d like to curl up with a good book. You’ll also appreciate the private ensuite bathroom. This contemporary bathroom attached to the master bedroom features a vanity with sink and open storage, commode, and a stunning shower with a unique corrugated metal design. You’ll appreciate the style and convenience of this bathroom, as well as the big, fluffy bath towels and personal hair dryer. Another King Master is on the 2nd floor and features a KING BED with a new cotton quilt and super-soft Egyptian cotton sheets, beautiful hardwood floors, and a flat-screen TV. This room also has a large dresser, 2 bedside tables and lamps for reading. This spacious bedroom features 2 sets of custom built-in BUNK BEDS. They are full-over-full, which gives you 4 full-size beds, with room for up to 8 children! There are even individually controlled lights for each bunk, in case some bunk room guests like to stay awake later than others. This a great place for children to hang out and play games or enjoy the flat-screen TV (when they’re not at the pool or the beach). Double windows overlook the beautiful pool and back yard. This bright bathroom features a beautiful custom designed sink with open storage, a commode, and a beautiful tile tub/shower combination. You’ll also find large, fluffy bath towels and a personal hair dryer. The 12’ x 24’ private pool is surrounded by brand new layered decks, giving you plenty of space to enjoy the Destin sunshine or some shade. You can relax in the lounge chairs on the decks which are surrounded by beautiful new landscaping. There’s even a bench swing! For outdoor cooking and dining, you’ll find a gas grill and a semi-shaded area with a picnic table. And for your children’s safety, there’s an alarm on the back door leading to the pool. Pool heat is available for an additional fee. The house is very close to the beach - one house off Scenic 98, with beach access on the same short block. We provide a cart with beach chairs and an umbrella, so you can roll your gear to the beach with ease. This home has a large driveway which accommodates 3-4 vehicles (depending on the size of the cars.) There is no on-street parking allowed in Destin. We are pet-friendly and welcome your dogs in our home. Pre-approval and a $200 + tax pet fee applies. Pet-Friendly! Dogs allowed with approval required. Small pet fee applies. We offer a small number of first-class vacation homes in Crystal Beach. If this home is not perfect for you, click here to see all our properties. We own most of our homes and are local, so we take exceptional care of them. No one offers better homes than we do. We will greet you here and make sure everything is just right.